Both instalments of the 'epic comedy of absurd proportions' about the dubious benefits of Western civilisation. 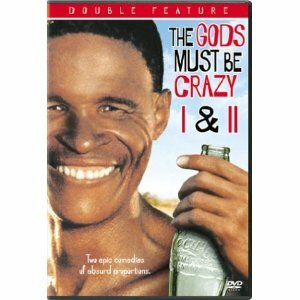 In 'The Gods Must Be Crazy', a Coke bottle drops out of the sky to the amazement of the Kalahari Bushmen who find it: they believe it to be a gift from the Gods. The bottle initially seems to the bushpeople to be a miraculous blessing, and they use it for all sorts of different purposes - but before long it becomes a source of conflict as they start to squabble over it. Eventually, one of the men, Xixo (played by real-life Bushman N!xau) sets out to return the bottle to the gods from whom he thinks it must have come, and so begins his first ever foray into 'civilisation'. In the sequel, 'The Gods Must Be Crazy 2', Xixo loses his children when they accidentally stow away on the back of an elephant poacher's truck while on a hunting expedition in the desert. Once again, Xixo must venture into civilisation to retrieve them. The only problem is, he is continually distracted by so-called 'civilised' people who seem be in greater need of rescuing than his children are. Uniquely quirky film about life in the desert. Or more appropriately in the savannah. The first film, by far the better one, misleadingly starts off looking like a documentary about the life of the Bushmen, which is definitely not. It does nonetheless provide an ironic look at the world from the point of view of a people who have never been exposed any other culture. White men are "illiterate" because they can't speak (click language) but emit funny noises like monkeys... and can't "read" animal footprints! In my view the film is highly useful to help us in the developed world put in the right perspective many objects that constitute our daily lives, like cars, houses, water and of course Coke! The film can claim credit for having brought to the world's attention the plight of the Bushmen, who have long been discriminated against by both blacks and whites in Africa. Ironically, it was produced by a white South African director during the period of apartheid. See more books and films about South Africa in this blog.